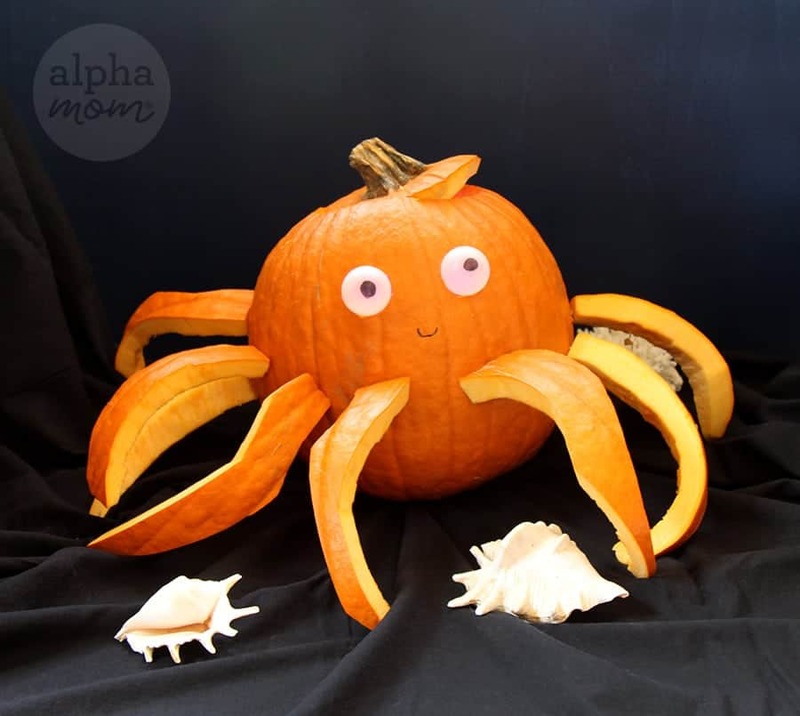 First, we brought you Snaily the 3D snail jack-o’-lantern so now we’re back with Octo-pumpkin, our 3D octopus jack o’ lantern. So easy, so fun! 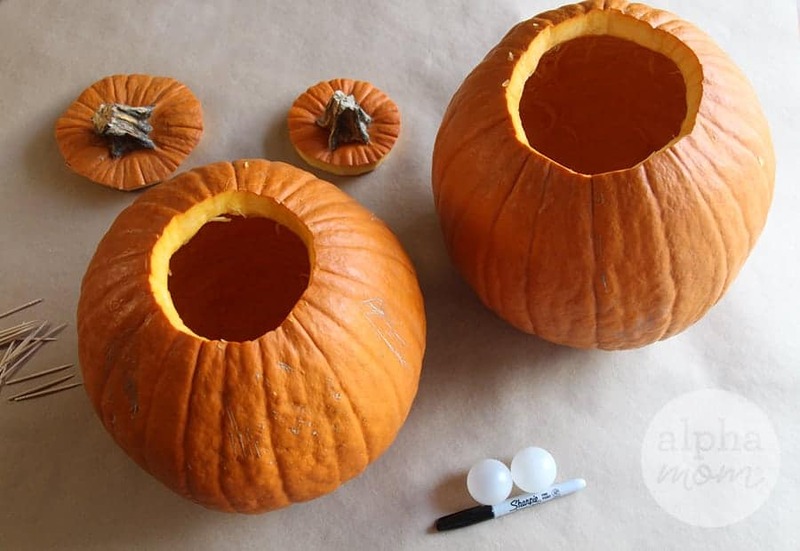 Step 1: One pumpkin you’ll carve as the head which is pretty much just cutting two holes for eyes just slightly smaller than your ping pong balls so they can squeeze in snugly. 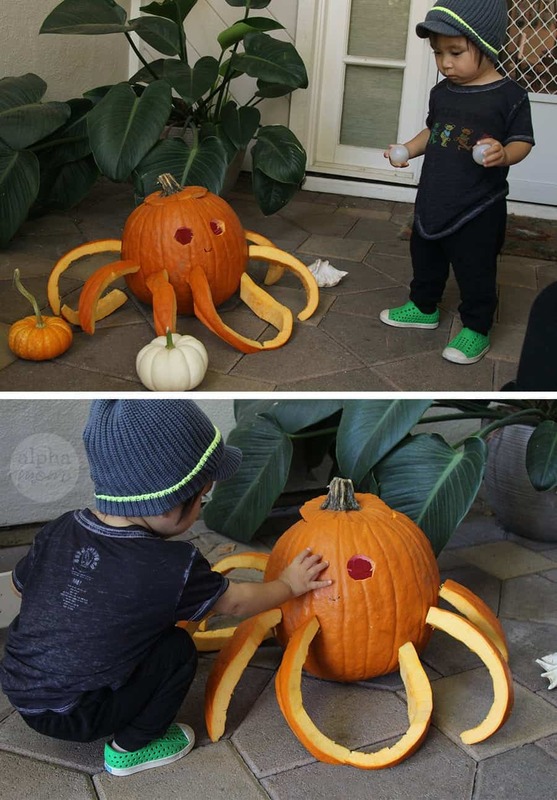 I would cut them lower than a usual jack-o-lantern so they look a little more like a real octopus (even though I didn’t really do that). 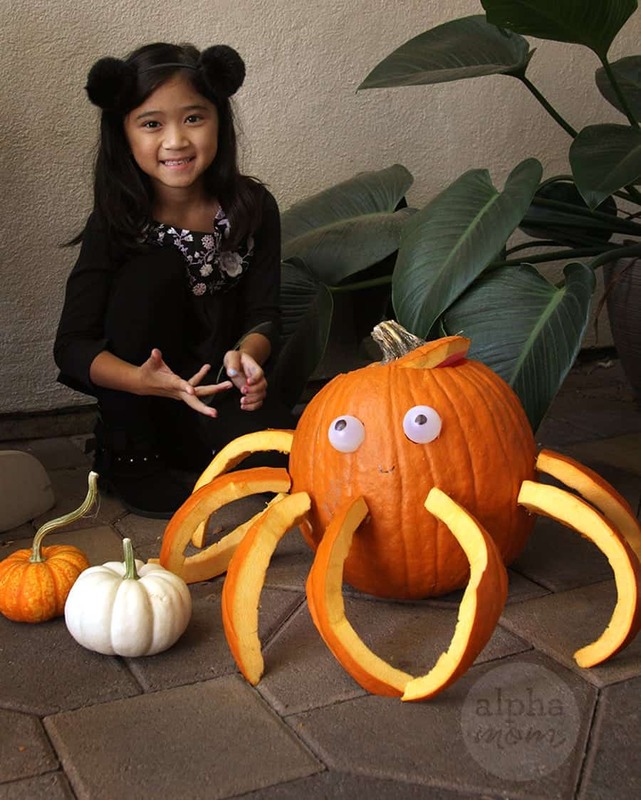 Step 2: Then carve the second pumpkin into eight tentacles. 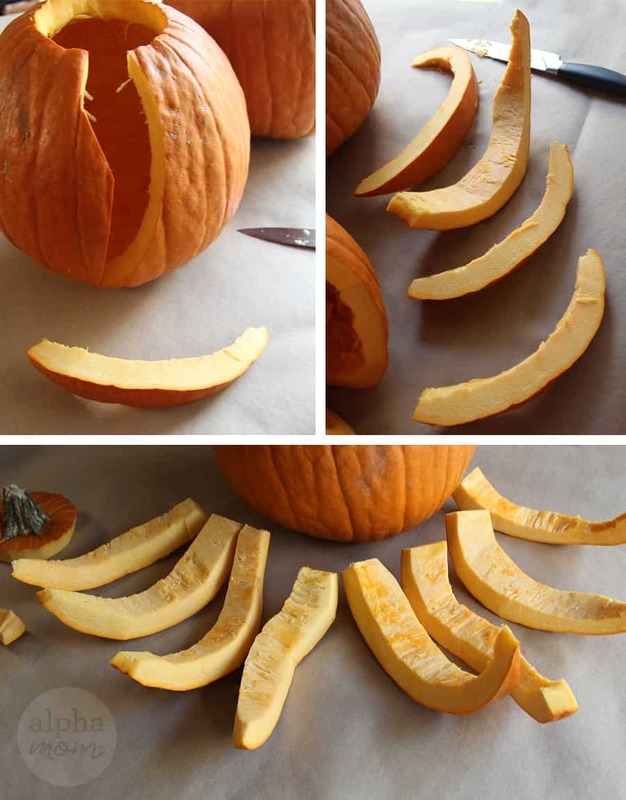 Think of it like slicing up a cantaloupe but wiggling your blade or knife as you cut so the tentacles are unique from each other. Don’t worry though if they all go the same way, you can just switch the top to bottom to create differing curves. 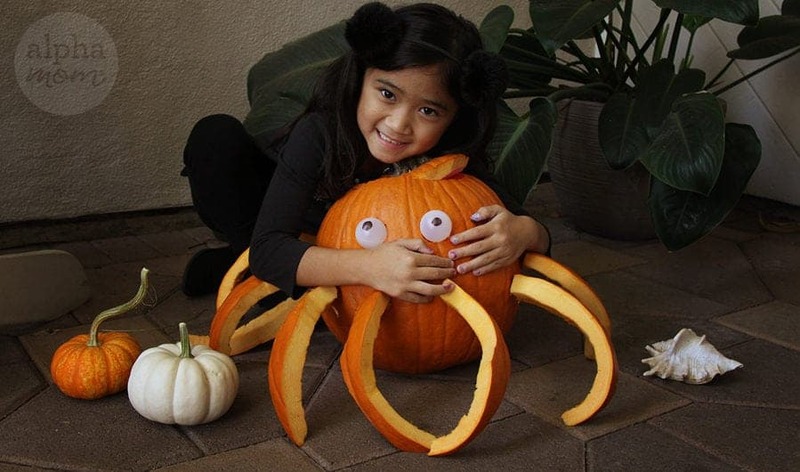 You might want to do this next part outside where your jack o’ lantern is going to live because moving it around with tentacles attached can be challenging (but not impossible). Tentacles reattach easily. 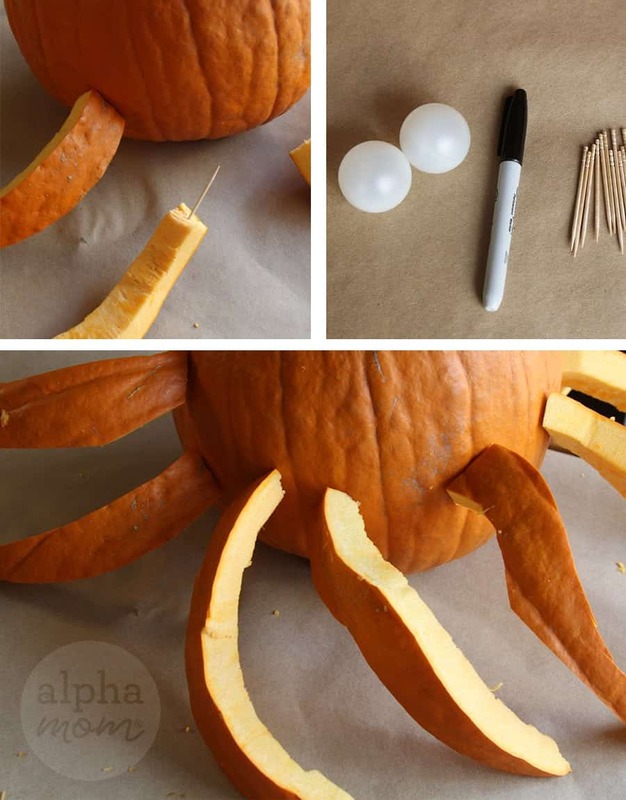 Step 3: Next, take your skewer and press the dull end into your tentacle base. Take the sharp end and push it into the head of the octopus. Step 4: Add tentacles around the bottom of the octopus head until you have added all eight. Twist them and trim to make them more believable. Step 5: Color your ping-pong balls with a small black dot in the middle with your permanent marker. Step 6: Pop your ping pong balls into place and then light him up with your battery-operated candle!